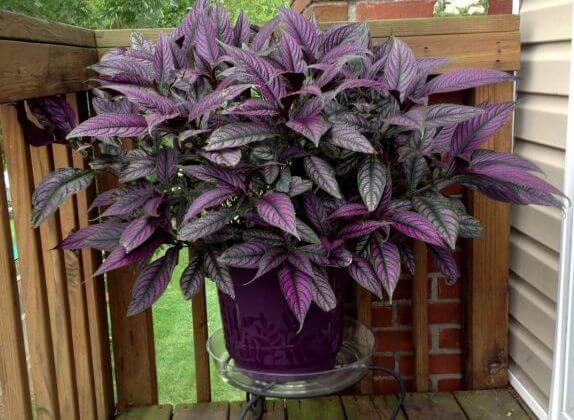 Persian Shield Plant (Strobilanthes dyerianus) is a delicate stemmed, tropical, evergreen shrub or subshrub that is grown principally for its attractive iridescent purple foliage. 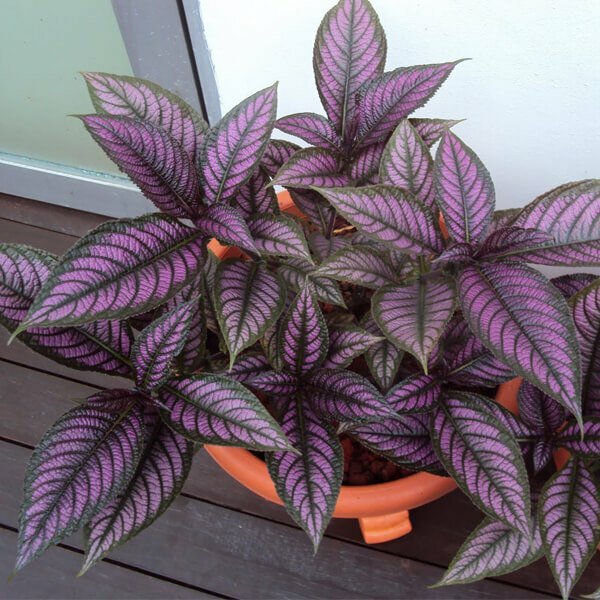 It has thick, variegated leaves with shimmering shades of purple, green and silver, with completely purple underneath, ovate-lanceolate in shape and measuring up to 7 inches long. The stems are squarish in cross-section. In autumn, it bears spikes of tiny, 5-lobed funnel-shaped violet flowers. Common Name: Persian Shield Plant. It thrives best in Bright indirect sunlight to partial shade. It prefers to grow in organically rich, medium moisture, well-drained soils. Water thoroughly, during the growing season. keep the soil evenly moist, but not soggy. In winter, reduce watering. Allow the top inch of soil to dry slightly to touch between waterings, but never allow the soils to dry out completely.. It prefers normal room temperatures 60°F – 75°F / 16°C – 24°C. It prefers moderate room humidity about 40% – 50% relative humidity or higher. Fertilize every two weeks spring through fall with a balanced liquid fertilizer diluted by half. Persian shield plant can be easily propagated by stem tip cuttings. Take 10 cm stem tip cuttings in spring and root them in moist soil. Cuttings should root in about two to three weeks. Persian shield plant has no serious pest or disease problems. Sometimes affected by root rot and spider mites.